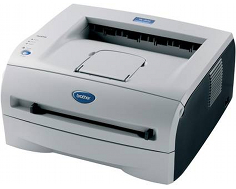 The Brother HL-2040 is a personal laser printer that, based on its smaller capacity and lack of expandability, is far more ideal for individual than workgroup, office or professional use. However, it is fast and it does offer a number of features that the home user may find useful. The HL-2040 measures 14.6" x 14.2" x 6.5" and weights 14.3 lbs. The printer will thus fit on most small desks, tables, and other workspaces without much trouble. Additionally, when warmed up, the printer produces 30dB of noise. This increases to 51dB when printing. The HL-2040 prints 20 pages per minute at a maximum resolution of 2400 x 600 dpi, consistent with current standards despite having been released in 2005 and being a budget laser printer then. The HL-2040 has a maximum load capacity of half a ream of paper, 250 sheets, and is rated at 28 lbs. Its output paper capacity is 100 sheets at a time. The HL-2040 includes an IEEE-1284 Parallel port and a USB 2.0 port. An ethernet connection can be added by installing an NC-2100p external ethernet print server, making the printer connectable to more than one user, but this is not an included function and will require the purchase of a component that is no longer manufactured and possibly both difficult to acquire and expensive to purchase. An 802.11b add-on is also available according to some suppliers but again is difficult to come by and not even listed on Brother's own spec sheet, calling into question its availability. Furthermore, adding an 802.11b device to a network has the potential to slow it down, as several consumer 802.11g and 802.11n routers will move all traffic at the speed of its slowest devices. The HL-2040 can handle plain paper, bond paper, envelopes, labels, and transparencies. Its paper tray can print letter, legal, executive, and papers of sizes A4-A6 and B5-B6. The single-sheet multi-purpose tray can print to all of these but also envelopes and custom-sized sheets between 2.75-8.5" x 4.57"-14", but requires sheets to be fed individually. Fortunately, the printer features a bypass input slot, meaning that it isn't necessary to remove all standard-sized paper before printing onto nonstandard pages. The HL-2040's 250-sheet capacity cannot be expanded. This makes the HL-2040 likely unusable as even a small office's primary work printer, as often offices go through a ream of paper in a day. However, for a single user, this likely will not be a major issue. The HL-2040 has a maximum capacity of 8MB of memory that also cannot be expanded. Several users complain that the HL-2040's image quality is subpar, though given its inability to print in color it would seem necessary to choose another printer if the user needs either well-printed images or consistent color prints. A number of users report that the HL-2040 curls paper dramatically, though using heavier paper and changing settings within the printer drivers can help to make this less of a problem. The lack of an LCD display renders the printer further unsuitable for office or workgroup use, as all software maintenance and administration will need to take place through drivers and on computers rather than on the printer. The HL-2040 includes drivers for Windows 9X-XP, Mac OS, and Linux. As a discontinued model, Windows Vista and 7 drivers have produced mixed reports concerning function and compatibility, though Microsoft indicates that the printer should function and drivers are available through Brother. Furthermore, given that the printer has been discontinued and is half a decade old, replacement parts in the event of hardware failure will not be as readily available as those for newer, more recent models like it. 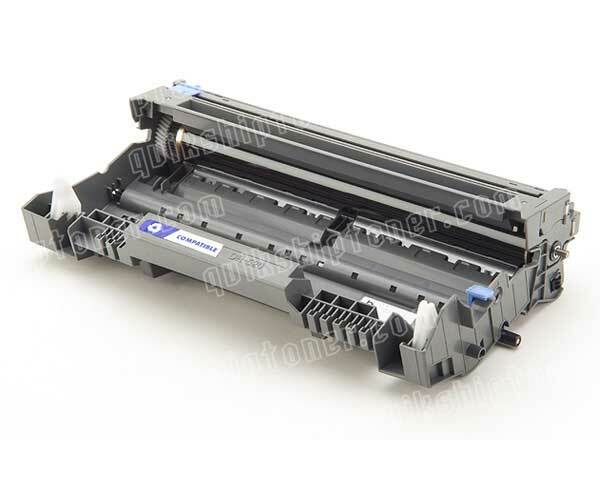 Review it: "Brother HL-2040 "
The HL-2040 includes a starter toner cartridge capable of printing 1500 pages at 5% coverage and a separate drum unit rated at 12000 pages. 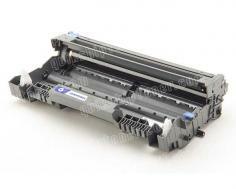 Replacement toner cartridges yield approximately 2500 pages at 5% coverage. 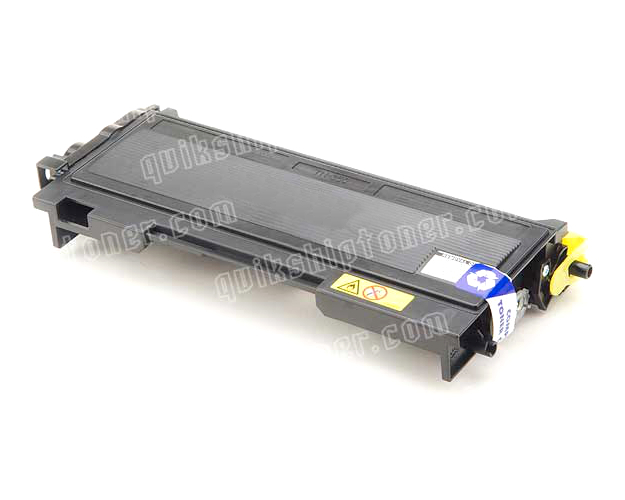 Because the toner cartridge and drum unit are separate, this reduces consumer costs but increases the amount of maintenance necessary to ensure printer function.